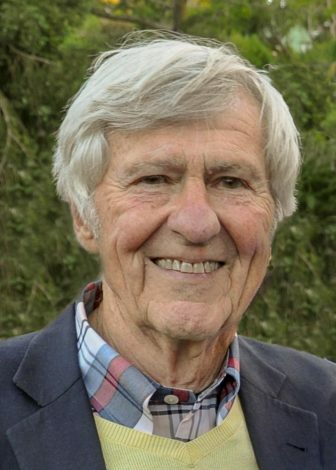 Wilder D. Baker, Jr. of Darien passed away on Nov. 22 after a long struggle with idiopathic pulmonary fibrosis. He was 86. Wilder Baker Jr., 85, passed away on Nov. 22. His funeral will be on Dec. 8. Wilder was born Dec. 4, 1931 in Washington, DC the only child of naval officer Wilder D. Baker and Cora Barry Baker, the daughter of a Washington correspondent. Due to his father’s obligations in the Navy, the family moved many times during Wilder’s childhood, which spanned World War II. Most especially in his memory were Hawaii, Coronado, California and London, but which included the Brooklyn Navy Yard, Washington, D.C., Norfolk, Virginia and two years in New Haven, when his father was head of the ROTC at Yale. Wilder graduated from Andover Academy, class of ’49 and Yale, class of ’53. His career in advertising led him to become CEO of Warwick, Baker, O’Neill. His outgoing, generous personality was ideal for helping his clients find the right voice for their products. Although he started in advertising during the “Mad Men” era, he was focused on a very forward-thinking management style. Wilder was ahead of his time in hiring diversity, and promoting women to executive positions. He was an excellent mentor to his executives, wanting only the best for his firm and his clients. This philosophy made him a remarkable executive. Wilder was affiliated with the Ad Club of New York, the Four A’s, and the AAF. After retiring, Wilder was on the board of the Hyde Leadership Charter School in the Bronx, and was an active member of the Talmadge Hill Church in Darien, most recently serving on the committee to choose a new minister. He was an avid sports enthusiast throughout his life, playing tennis, paddle tennis and golf all year-round. Wilder is survived by his wife, Vanda; two daughters: Brooke (husband Richard) and Dana (husband David); and their mother, Dorothy Baker. He has three step children: Magaret Epprecht (husband David), Thomas McGlade, and Katherine Stowe (husband Spurgeon). He loved his nine grandchildren deeply: Noa, Crea, Milo, Tyler, Kylie, Liza, Andrew, Hugh and George. He will be greatly missed. A Memorial Service will be held at 10 a.m., Saturday. Dec. 8. 2018 at the Talmadge Hill Church on Hollow Tree Ridge Road in Darien. In lieu of flowers, donations can be made to the Wilder Baker Relief Fund at the Hyde Leadership Charter School, 730 Bryant Ave., Bronx, NY 10474 (the tax ID number is 74-3162136).